I am 54 and have always been an active enthusiast of outdoor activity especially cycling, walking and skiing but I have never had the opportunity to undertake a challenge and it has been a lifelong dream to visit the Himalayas. I live in Wirksworth, Derbyshire and until being diagnosed with breast cancer in 2007 I was employed as an Urban Designer with the North West Development Agency. In June 2007 I was diagnosed following a routine health check and quickly had a mastectomy followed by 7 months chemotherapy. I decided not to continue working which had required living away from home during the week and now I do some consultancy work and voluntary work including supporting the Walking for Health Campaign which is promoted by the NHS and Natural England – and I am a fund raising ambassador for Breast Cancer Care . I first became aware of Challenge Cancer Through Adventure via a poster at my local leisure centre and decided to investigate the website where the Derwent Dambuster Challenge caught my interest and I applied to do the Challenge. The event was fully subscribed so I volunteered to help and found myself helping to marshal this popular event. During the event I took the opportunity to find out more about the charity and decided to make an application to make a dream come true. I have always wanted to visit the Himalayas and had kept an article about a trekking group in Nepal reported in the Guardian which was started by 3 sisters to provide training and employment for Nepalese women. 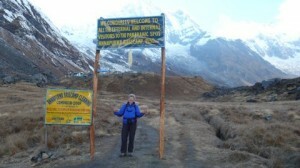 I researched the trekking group – and the trek and made an application to CCTA to undertake the Annapurna Sanctuary trek starting in October 2010 for 12 days with a women’s only group. The group had 11 women from all over the world – India, America, Australia, France and UK – with 11 female porters and 2 female guides. It was a great group who all enjoyed each the company and shared experience of having to walk 7 hours a day and get acclimatised before reaching the Annapurna Base Camp at over 4000metres. CCTA made this happen for me, their support and encouragement has made a great difference and I have returned from the trip feeling ready and able to continue with new challenges.